At 5:30 p.m. yesterday the Reds and Phillies took the field to complete the game from the day before. Only the bottom of the ninth needed to be played for a regulation game, so the Reds were up to bat first in front of a crowd of literally tens of people. It makes sense that people didn’t come out: it might have taken a little as one pitch to finish off the game in a walk-off, and then they would have had nothing to do till the next game started but walk around trying to find signal for their phones. It was more than one pitch, but it was still only about 10 minutes for Zack Cozart to single, Joey Votto to walk, Brandon Phillips to reach on an error, and Jay Bruce to single in the winning run. Do those other guys count as stranded runners? That set up the Reds to try for the sweep an hour later. This match-up didn’t look as favorable, with Mike Leake going out against a pretty hot pitcher for Philly. But the offense put the hurt on John Lannan, touching him for 6 runs in 1.2 innings. Cozart and–get this–Leake each had 3-hit games and scored 6 of the Reds’ eventual 11 runs. Meanwhile, Reds pitching held the Phils to just 2. It’s Johnny Cueto’s turn to pitch, but he’s hurt, remember? So they’ll be sending down young Justin Freeman who initially took Cueto’s roster spot and instead bring up Tony Cingrani (LHP, 0-0, -.– ERA). Cingrani’s really been something special in the minors, but he’s going up against another young phenom in Jose Fernandez (RHP, 0-0, 0.82 ERA). Frenandez has been crazy-good for the Marlins so far, but he won’t even be drinking age until the end of July. It could be an unpredictable game. 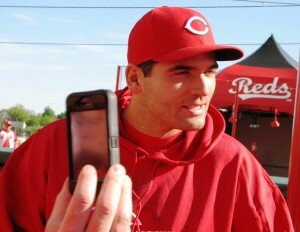 First pitch at 7:10 p.m.
Joey Votto’s not paid to get hit by pitches! Right, @enquirerdoc? In the spirit of bandwagon jumping, we here at RHM have created the Things Joey Votto isn’t paid to do Tumblr. Go check out some of the ideas that are already out there and submit your own. He’s likely to get to #3 before this season is done. Dang, I never would have guessed that was going to happen 5 years ago.